Many camouflage or other military-themed uniforms these days are produced and marketed in conjunction with the Wounded Warrior Project, which has become a popular charity for uniform tie-ins and merchandise lines. Under Armour has particularly close ties to the WWP. Under Armour is the WWP’s official apparel provider, and has created some of the most notable WWP-associated uniforms. Remember Northwestern’s “bloody flag” uniform, produced for Veteran’s Day in 2013? That was an Under Armour/WWP design, and the company has produced lots of other WWP-branded college football uniforms. Under Armour has a dedicated line of WWP merch, and WWP CEO Steve Nardizzi can often be seen wearing the Under Armour logo. Whatever one thinks of the uniforms (my own position on them is well-documented, so I won’t repeat it here), WWP’s mission appears to be a laudable one. But now there are reports that WWP, however laudable that mission may be, is a wasteful, inefficient organization that spends too much on itself while short-changing vets, and is run more like a for-profit corporation than a non-profit charity. Tax returns and other documents show that WWP spends about 40% of its incoming donations on overhead (including booze-filled parties at high-end resorts), while other veterans-centric charities spend less than 10%. [I]n its swift rise, [WWP] has embraced aggressive styles of fund-raising, marketing and personnel management that have many current and former employees questioning whether it has drifted from its mission. There’s a lot more, including some fairly incredible quotes about corporate branding (at one point Nardizzi, the CEO, actually says he’s trying to model WWP after Starbucks — really! ), but you should read it for yourself. Why am I writing about this today? Because the leveraging of military- and veterans-themed sentiments, and the larger leveraging of “heroism,” is an increasingly large factor in the uni-verse. There’s an underlying assumption among many fans that military-themed uniforms are by definition a good thing, even when the designs are bad, because they help support a good cause. But is it really a good cause if the organization on the receiving end of the funds and the goodwill is spending a disproportionate amount of the funds on itself? That’s something to think about the next time you consider purchasing a WWP-related jersey or cheering for a team that wears a WWP-related uniform. If you want to support veterans or other military causes, remember that there are plenty of other vets-advocacy organizations out there that don’t get involved in sports uniforms — and don’t spend so much of their donations on overhead, or model themselves on Starbucks. New stirrups offer: Longtime Uni Watch reader Rob Ullman recently won an eBay auction for a big ol’ box of stirrups like the ones shown above. The box had 13 pair (“12 more than I need,” says Rob), so he’s hoping to sell the extras to Uni Watch readers. Price: a very reasonable $8/pair, including shipping, while supplies last. If you want in, send Rob $8 via PayPal, using rob@robullman.com as the payee. Thanks. Making Jackie proud: My thanks to everyone who shopped at our Uni Watch T-Shirt Club Second Chance Store, which is now closed. Sales were modest, which is fine, but I was happy to see that our Jackie Robinson Day design was the top seller (just as it was in 2015). As I explained when we first launched this design last April, I have no interest in profiting off of Jackie Robinson’s name or legacy, so I donated my share of the proceeds from the April shirt — $4,431 — to the Jackie Robinson Foundation, and ESPN matched my donation. According to Teespring, my cut on the Second Chance sales of this shirt comes to $180, so I’ll be making another donation in that amount, and ESPN will once again match it. Thanks for making that possible. That closes the book on the 2015 designs — there will be no third chance. As for the 2016 program, we’re working on the initial design and hope to have it ready for you shortly. 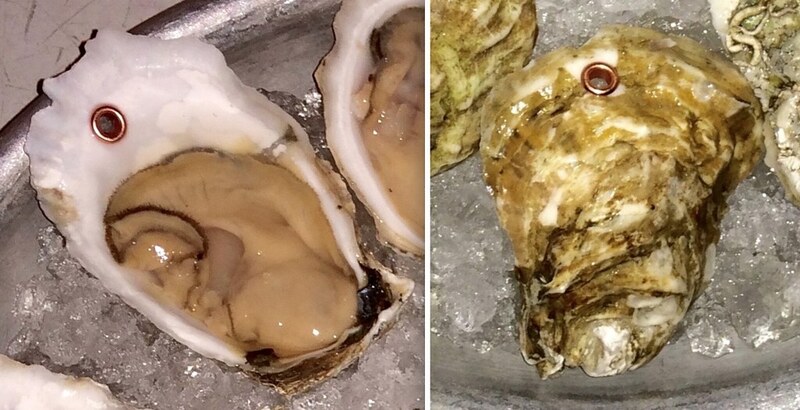 Gromm•It update: What’s even better than an oyster with a pearl? See for yourself over on Gromm•It. Baseball News: The Mets will give away a Yoenis Cespedes neon compression sleeve in July (from Brian Wulff). … New uniforms for Michigan State. … Someone made a Royals coloring book. … The Columbia Fireflies, formerly the Savannah Sand Gnats, revealed their new uniforms. The caps will have a glow-in-the-dark outline around the logo (from Clint Yarborough). … New uniforms for North Carolina and Ohio. … New hats for VCU (from J Scott). … Oklahoma State has a new digital camo hat (from Dylan Hays). … New uniforms for UNCW. … Todd Radom had a discussion with Dave Winfield about sports visuals, including Yankees pinstripes, Padres brown and gold, the Twins’ TC logo, and Winfield’s new personal logo, which Radom’s new branding firm designed (from Phil). NFL News: Verizon made a commercial with Super Bowl fans in chintzy replica jerseys with mismatched number fonts. … Thirty-four years after hosting the Super Bowl, the Pontiac Silverdome is in tatters (from Brinke). … Former Packers lineman Jerry Kramer is auctioning off items from his personal collection, including a Packers letter, NFL recruiting letters, and a college All-Star sweater (from Johnny O). … In the late 1970s, George Kunz of the Colts had some oddly placed TV numbers (from Bob Gassel). … Two NFL Shop notes: Outdated Browns items from 2013 and 2014, just before the logo change this year, has been labeled “Historic Logo” merch. Also, Rams clearance items are being called “Classic St. Louis Rams” apparel (from Joseph A. Bailey). … The Chicago Sun-Times printed a throwback cover this week to commemorate the 1985 Bears. As a Chicago resident, it’s my personal belief that the members of that team actively root against current Bears teams, like how the 1972 Dolphins root against undefeated teams. As long as the ’85 Bears are the city’s last football champs, Mongo, Ditka, the Fridge, Samurai Mike and the gang will remain the toast of the town and reap the endorsements, appearance fees, and non-stop adulation and attention. … 7-11 has been selling Super Bowl 50 Slurpee cups with team helmet straws (from Chris Edwards). College Football News: Donald Trump was presented an Iowa Hawkeyes jersey. … The ACC released its 2016 helmet schedule (from Dave Garabedian). Hockey News: Jets D Dustin Byfuglien has custom All-Star skates. … Devils G Cory Schneider will wear pads with guitars on them during All-Star weekend in Nashville (from Rob S). … The Kalamazoo Wings will wear Star Wars jerseys this weekend (from Dave Barringer). … The Fairbanks Ice Dogs will wear pink sweaters for three games this weekend. … Goalie Ben Scrivens was traded to the Canadiens this year, but he still uses his old Oilers stick. NBA News: The Lakers will honor Shaq with a statue outside of the Staples Center. … Celtics G Evan Turner has the ET logo on his personalized sandals. … Here’s how the Cavaliers have fared while wearing each of their eight uniforms this season (from K.C. Kless). … A national bank bought the naming rights to the Warriors’ new arena. The Chase Center will open before the 2019-20 season. … The Clippers and Hawks went shirts vs. skins last night. College Hoops News: Baylor’s Rico Gathers suffered a jersey tear last night (from Austin Aaron, via Phil). … Unclear if Rick Pitino is wearing sneakers on the sidelines, but his assistants are wearing button-ups and slacks with athletic shoes. … Virginia Tech wore pink tops and pink shoes for warm-ups last night. Then they wore black jerseys with pink trim for the game (from James Gilbert and Andrew Cosentino). … Yesterday’s Ticker mentioned that Oklahoma State would be wearing throwbacks to mark the 15th anniversary of the plane crash that killed 10 people. Turns out they also wore throwback warm-ups with memorial NOBs/numbers. … The Sporting News ranked the best active players that wear each jersey number. … Saint Louis has a two-piece warm-up top. … An Indiana sportswriter gave the lowdown on the state’s 10 Division-1 arenas (from Steve Jacobson). Soccer News: New York City FC is letting fans pick the captains’ armbands (from Adam Vitcavage). … A kid in Afghanistan fashioned a Lionel Messi jersey out of a plastic bag. After a Twitter search, the kid has been identified, and may get to meet the soccer star (from Phil). Grab Bag: Under Armour is selling a Jordan Spieth hat. … Interesting anecdote in this story on the rise of Under Armour: A timely check from Georgia Tech’s AD helped save the company in its early days (from James Gilbert). … Adidas revealed its men’s and women’s USA Golf uniforms. John Okray, quoting from Golf Digest, has further details: “The retail versions displayed Wednesday will go on sale in June. The specific apparel worn by the athletes will be identical, except it will not have the Adidas logos on the chest or sleeve, per International Olympic Committee rules. All American golfers competing in Rio will be required to wear the Adidas apparel regardless of any individual endorsement deals they might already have. The lone exception is with their footwear, in which players will have the option of choosing from other manufacturers.”… Also from John: Here’s a look at USA’s Ryder Cup caps. In that piece about the Pontiac Silverdome is a cool shot I’ve never seen of Joe Montana wearing #19 for the 49ers. He definitely never wore 19 during a game for the 49ers. I’ll post the photo on Twitter and see if anyone knows more. Ah, so maybe the photo is actually from ’79, not ’81. Good work! Glad to see another luminescent cap out there. I treasure my old Casper Ghosts cap; luminescence is a gimmick, sure, but visible energy(light) is my medium as an artist, and I’m tickled when those related materials make it into consumer products. We have a name for the tomfoolery the WWP is committing: the non-profit hustle. Sadly, it’s rampant where I’m from, a scourge I try to do my part to combat. I wish the squatchee was GITD also. The whole Fireflies set is terrific. It’s a very modern style from top to bottom, but it’s well designed so it works for me. Demerits only for the custom number font, which is actually not terrible but sacrifices too much legibility for merely aesthetic adornment for my taste. The number font really bugs me. Otherwise, I’d wear that. Unfortunately, this means no more Savannah Sand Gnats, at least for now. Back in the late 90s, I received a catalog that had caps from all the major sports, some colleges and all the minor league baseball teams. A co-worker and I pored over that catalog for quite some time and ordered a bunch of caps. My friend got the Sand Gnats…next to the Lake Elsinore Storm I think it was his favorite. Ah, but now they can have Sand Gnats Throwback nights!! I had the exact same experience. I’ve worn my way through dozens of caps over the last 20 years or so, but that Sand Gnats hat was one of my all-time favorites. My favorite thing about the Sand Gnats was when they were affiliated with the Washington Nationals. For a brief shining moment, the Nats’ farm system included the Nats, the Gnats, and the Senators. The fact that Wounded Warriors was sketchy was pretty evident after seeing the rising prices each year for their annual Warrior Dash races. The group was obviously bringing in money hand over fist, but something just didn’t right about it. Something definately did not pass the smell test. The WWP operational greed factor is indeed excessive, though sadly not uncommon, when you combine their business practices, (according the NYT) we see an almost cult like treatment of non-believers. As horrible and wasteful as they are, you have to step back in awe of the worst of the worst offenders of the non-profit pay for play scenarios (not counting organized religion okay) can be viewed here. See a pattern forming? Â Kids, Cancer & Cops. Â With a dash of Vets in the mix. Are you sure Wounded Warrior and Warrior Dash are related? Sorry, it’s the Tough Mudder race that is tied to Wounded Warrior. Same premise though. I thought this actually meant a schedule of which alt/dumb helmets were going to be worn by what what teams at what games. I can confirm that he was, as was Painter and his staff. The broadcast took a moment out to speak about it. Not all heroes are non-profits and not all non-profits are heroes. As a life long Chicago resident I do not believe that 1985 Bears members root against current teams. They seem to be outspoken about recent teams because they want to see more out of them. Dan Hampton has lots of opinions about current teams but the guy was outspoken against his own Quarterback and chose not to participate in the Super Bowl Shuffle. The problem with Chicago and that team is that everyone hangs their hat on that team and compares everything to that once in a lifetime collection of talent and personality. Agreed. Another angle on this is the 1985 players promoted themselves aggressively and just never stopped. Might have been a smart move, what with salaries not as big back in the 1980’s. Players from the 2006 team that went to the Super Bowl had the same chance, but were almost nowhere to be found outside of game day. Urlacher, Briggs, Hester, Tillman. These guys could have owned the town, but were fairly low key. They also made a ton more money playing the game and might not have needed to shill for the local car dealers, get their own radio shows, or make a video. I completely agree with all your comments. While all were great on field leaders they all lacked a lot of personality off the field. Great players and people but not great personalities from the 2006 team. The 85 guys really did cash in with Payton, McMahon and Fridge to name a few, cashing in on national endorsements. I remember going to my 1st Lions game at the Silverdome against the Jets where Barry rushed his 10,000th yard. They won and it was really loud. I was only…6? We were in the upper bowl behind one of the endzones but I also remember the long wait as someone was injured (later in life I was told it was a Lions player who hurt their spine) and having to wait for an ambulance to get to the field. Not to poo-poo a 6-year old’s memory, but Sanders surpassed 10,000 yards against the Oilers. Mike Utley *may* be the player you remember getting injured, but that was against the Steelers. Likely he’s thinking of Barry passing 2,000 yards in a season, which did happen against the Jets, with Reggie Brown being the injured Lion. That game is uni-notable as it was the last game the Jets would play in these unis. I always felt skeevy about Wounded Warrior, and now I guess there’s some confirmation of why. I remember when they started popping up at sporting events, and it seemed like they went from not existing to having WWP events with nearly every league and team I could think of in a matter of months. It seemed way too fast to me to be legit. I’ve always gotten the heebie jeebies from them too. I think it’s their cult-like following similar to Susan G. Komen. My Father was a WWll veteran. When he passed away nearly 7 years ago, our family requested in lieu of flowers that a donation be made in his name to the WWP. They are affiliated with Walter Reed Hospital where he was born. Words cannot describe how sickened I am about this story. It’s a disgrace that a private charity is even necessary so that vets can get the proper care they deserve. UA should disassociate themselves from this organization. I hope these jerks rot in hell for abusing funds and dishonoring my Dad’s memory. Hypocrisy is alive and well, but never more so than with with long-time nonprofits who, as a factor of longevity and headcount, become more interested in their survival than their mission. The name of the Red Cross has been mud in our house for as long as my mom realized where her charitable donations were going. Is their a better place for a scoundrel to hide than in a benevolent organization where a steady supply of human shields deflects criticism? Todd Radom writes an article for the Sporting News interviewing Dave Winfield about team jersey designs whilst launching his brand New brand company for the stars (Dave Winfield amazingly is one of his clients) wrapped around a marketing process, wrapped in good artwork – well I’ll give him that. No disrespect to TGTR… someones gotta make logos for rich athletes and their causes, hey I hear WWP is got cash to burn and is in desperate need of a makeover. Price: a very reasonable $7/pair, including shipping, while supplies last. Did I miss something here? Is it $7 or $8? Could we do some 2016 shirts without the NOB? I liked a few of the designs, but some of the messages seemed silly to me. The only one I bought was the end of the year plain one. I liked a few of the designs, but some of the messages seemed silly to me. (1) If you didn’t like the back of a shirt, then what you’re actually saying is that you didn’t like the shirt’s design (which is fine). The design is the totality of the shirt, front and back. (2) These year’s shirts will not have a back design — front only. Oh please Paul. It’s certainly possible for someone to like the overall look of a shirt, but dislike the “message”. The reaction to the Pandering shirt comes to mind. It’s no different than enjoying the way a song sounds, but disliking the lyrics. 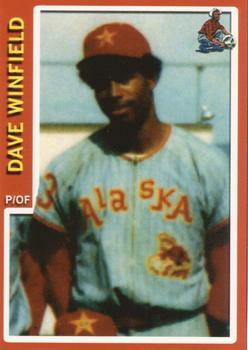 Or, perhaps as a better example, liking Washington’s uniforms while insisting on a name change. It’s certainly possible for someone to like the overall look of a shirt, but dislike the “message”. The “overall look of a shirt” (your words, not mine) INCLUDES THE MESSAGE. And yes, the “Pandering” shirt is a prime example. If you don’t like the message on the back, then you don’t like the design of the shirt, because the design includes (and, indeed, largely hinges upon) the message on the back. We’ve been thru this many, many times. Not going to relitigate the simple reality of the totality of a thing being, you know, the totality of the thing. Let’s move on. Thanks. I think a cotton shirt with “Overpiriced Polyester Shirt” across the front would be more apt. Trouble is, those guitars only have three strings each. Like the old pic of Montana and Walsh with Montana in a #19 49ers jersey. (It’s in the Pontiac Silver Dome link) If he was wearing 19 then switched to 16 anyone know why? We know he wore 19 with the Chiefs because it was his old high school number, but I’ve not heard why he switched to 16 on the 49ers. Good question. The 49ers did have a QB the previous year who’d worn 19. Duplicate numbers are allowed during pre-season, so maybe they were both on the team wearing the same number, and Montana chose to switch, then made the team while the other guy got cut, and kept the number out of superstition? I’m a veteran who has contributed on many occasions to WWP. I also contribute to the Red Cross, USOC, USO, and many other charities. ALL charities have to spend to get contributions. If you do your own research (Form 990s are a public document) you can choose based upon finances what and who you contribute. Like I do. I’m not naieve enough to believe that CBS and NYT weren’t in cahoots in their investigation. ALL charities have to spend to get contributions. Straw man argument. Nobody said charities didn’t have to spend. But some charities spend a lot more than others and are therefore much less efficient in delivering on their mission. WWP appears to be one of those groups. I realize conspiracy theorizing is fun, but that’s not how journalism works. CBS and the NYT are trying to *scoop* each other, not be “in cahoots.” And just for the sake of argument, even if they were “in cahoots,” that wouldn’t necessarily cast any doubt on the veracity of their reporting. Let’s say, again for the sake of argument, that CBS timed this story for the February sweeps (even though it’s, uh, late January). One more time: How does that cast any doubt on the veracity of their reporting? You’re good at trying (not very successfully) to indict the messenger, but you haven’t yet dealt with the actual message. Try again. I work, as they say, “in the nonprofit space.” Yes, it costs money to raise money. Yes, healthy national organizations tend, ironically, to have higher overhead than local organizations. But Charity Navigator gives WWP two stars for its financial conduct and controls. That’s a red flag for many donors and foundations. I know a lot of people in philanthropy for whom anything less than three stars for finance on Charity Navigator is an automatic “no” when an organization seeks a donation. And if you look at WWP’s year-to-year income and expenses, you see that the proportion of money spent on program expenses – you know, actual charity – is going down. That is, WWP has put itself in a position where every new dollar raised is actually detracting from its charitable work. Facts are facts, and on the basis of the raw numbers, nobody should give any money to WWP at the moment, not until we see the organization implementing serious reforms in its business practices and fundraising strategy. This isn’t about the intentions of any of the people at WWP. We can assume the best of motivations all around by everyone involved. But when it comes to dollars, the numbers don’t lie. Even if everyone in the organization has the best of intentions, they’ve gotten themselves in over their heads financially, and it would be irresponsible to give money to the organization until it can credibly demonstrate an ability to manage growing finances responsibly and sutainably. Which it could do in a matter of a couple of months if WWP’s leadership takes the current bad publicity as a wake-up call to reform rather than as a warning to circle the wagons. I’ve spent most of my working life working for non-profits, I’ve volunteered with several and I’ve served on a few boards of directors too. There are almost always some opportunists, some sluggards and some folks who just don’t think things through. It’s why oversight and transparency are so important. Sadly what went on at WWP goes on far too often, even if on a smaller scale. You are describing the Combined Federal Campaign. We all had to chip in, if you didn’t, you might as well pack up your flight suit and go home because your career was toast. Same for the monthly dues to the Officers club. Pay up or get out, because your chances of promotion are about as successful as winning the billion dollar lottery. It’s not a charitable donation if it is mandatory. Not complaining, just stating how it is. Who you give to after military service is up to you and good on you if you do. Poorly managed operations that reward themselves garishly in the name of charity are BAD. We all can agree on that. Pointing them out is what is going on here. donator Cave is my watchword… or would be if I had one. Secondly, Mr. Lukas is correct in stating that in the C-c-communications business, being first with the story is gold. Rather than go into a long dissertation as to how the media bidness works, allow me to sum it up. It’s kinda like a winners and losers thing. Brings to mind that most of us in the corporate world have experienced or heard stories of mandatory donations to United Way. The Chicago Sun Times throwback cover was interesting, but I am not sure why the Harry Carry logo is on there. As far as I know he had no connection to the Bears organization. It’s an ad for the restaurants, which did not exist in 1986, nor did the world wide web (note the URL at the bottom the ad). Hate to say this, but Wounded Warrior Project’s profligacy is hardly a new story. I had the same thought. In fact, I thought we had the same story on this very site a while back. I’ll see if I can find it. Down to just a couple (as in two) pairs of stirrups left, folks…thanks for your helping me get these out in the world! And extra special thanks to Scott R! A fair bit more mustard seems to be working its way into the Twins uniforms with this one. That’s one boring alt. How can you make a red alt so boring? Not sure about the Kasota gold. (Named after Kasota limestone quarried down in southern Minnesota. Target Field has a lot of Kasota stone.) I like it more as a color than as trim highlight. The Twinkies can call it whatever they want. It’s mustard. I like it in theory. In print design, the Twins are using it nicely. And on the cap logo, I think it works wonders for the TC logo. Mostly fixes the TC design’s biggest flaw. But other than the neck and sleeve trim, the Twins don’t seem to have figured out how to use it effectively on the jerseys. That brings up a debate. Should we be upset that good things are being done, but for the wrong reasons? I personally feel that charity being done for “marketing” or “brand” reasons is pretty gross and disingenuous, even if good things happen as a result. Wow. Everything is about selling “gear” nowadays. This is ridiculous. 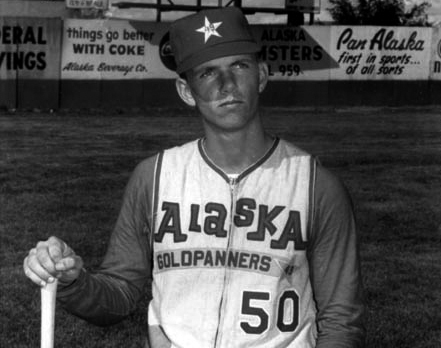 The Winfield piece (yes, as mentioned above, some rather unjournalistic marketing by SN or Radom, or somebody) led me to a google image search of the Alaska Goldpanners. Some great unis through the years. Unsung great uniforms of the Goldpanners. It is an amazing example of a “sum of the parts design.”Â If you care to follow baseball uniÂ standards it shouldn’t work – Unaligned blocky letterforms looking thrown together. Below the team name is that Golden Shooting-Star with the team name arching across it. Loud garish colors, totally untraditional, yet it is glorious. It even works on a vest. Â That’s the spaceman Bill Lee in repose. Um… the Detroit Tigers may have an orange spring training cap? Interesting that they’re not available for purchase right away, considering we all know that’s the real reason these things are introduced. I wonder if sometime in March they’ll have *another* big reveal with these (minus the ST logos) as the new BP gear. Obviously these are completely superfluous all around, but looking aesthetically some look good (Rays) some look terrible (that Dodgers D cap is terrible). I’m not surprised that the Yankees cap is basically the 2014 All Star design. Seems to have been very popular here in NY. See them a lot, even to this day. In fact, it’s one of the only out of the norm caps I personally own. A quibble on the otherwise terrific ESPN piece. The patch of “AZ” or “FL” is not shaped like an interstate route marker, but a US route marker. The interstate marker has fewer curves and peaks at top corners, like this. Yes, “shaped” like a US Hwy sign. Certainly not colored like one. Not colored like an Interstate sign either. I guess they’ve invented something original! Speaking of, it looks like the Federal Highway Administration has reversed its 2004 decision to switch from Highway Gothic to Clearview on highway signs. Tremendous catch — thanks for that, Gregg! The Bucs have a “Kids Andrew McCutchen New Replica Alternate Jersey” promo listed for June 26th…I’d been wondering what that was all about! Okay, stirrups are ALL GONE! Thanks folks! Check the sleeve patch – it’s different on the front shot and the back shot. Are teams going to wear these same uniforms (without the spring stuff) for BP? Been around the WWP for more than a decade now. To their credit they were there first to help veterans returning from the wars with TBI, amputations, etc. As with any organization, money and power corrupt over time, especially easy to do when it is tied to our country’s war machine.